I am still working hard on the Lost Loot Pre-Alpha #2 release which will be landing very shortly. This version switches the game to a miniature world third person design primarily for comfort.Check out my last blog entry on The quest for comfortable VR for more details about why I am making the change and what it looks like. I was lucky enough to get Cymatic Bruce from AltspaceVR to try out this new version at the Boston VR Meetup in December. He had a blast getting eaten by the cute little sharks and hopefully some day he will try out this version on his Livestream! So, the next and final Lost Loot Pre-Alpha #3 may be an effort to do just that. I plan on using a free tool from Autodesk to generate a placeholder character and also put in some placeholder items as well – a face mask, flippers, snorkel, and air tank etc! In the interest of VR science, and for anyone worried about the shift to a miniature world third person view, I have decided to put in an option for playing in a first person full scale mode. This won’t happen for a while however and will likely be at a later Alpha stage when many other things are working. There will also be the option to play in normal screen mode, without a VR HMD, but who would want that?! And, speaking of Alpha progress. I have spent a fair amount of time working on the new World Machine, Terrain Composer, and RTP workflow for island generation. Here is an island generated in World Machine. HoloLens, which is an AR headset that Microsoft has been working on for 5 years and is designed to be part of Windows 10! Wow, Microsoft is looking to the future and that is awesome. It is still very early and will likely take years and multiple versions to perfect, but the idea is there and there are so many amazing possibilities! I can’t wait. The best down to earth article about it is the Engadget one. Other articles that are good include the Ars Technica and WIRED ones. And, Five Questions About Microsoft’s “Project HoloLens” provides a good dose of reality! It seems like HoloLens is now in competition with Magic Leap. We also finally have a glimpse of what the Google backed Magic Leap is supposed to be with all the patent information becoming public. It is interesting to note that both the Magic Leap device and the Microsoft device are completely self contained so it is similar to Gear VR as a wearable solution. This also brings up the dreaded heat and power issues related to the CPU/GPU needs of producing high resolution realistic stereoscopic visuals. Making these things simple and wearable is definitely the path to go. However, it really limits what is possible content wise which is a bit disconcerting. Developers have already voiced the trials and tribulations of making something that can run smoothly at the speed and resolutions required with Gear VR. The device really only works for small sessions of 10 or 20 min and any kind of demanding game will drain the battery in no time and generate a lot of heat. Those issues are always going to be present and I still feel they are going to be a really big impediment going forward. Consumers expect a small device with a quiet and comfortable experience that runs for a long time. It could end up being an area of real innovation for folks developing content. Even though we didn’t really hear anything new from Oculus, the general public finally was able to get a taste of presence with Crescent Bay at CES. Everyone who went to Connect in September was able to experience the new prototype then. The best technical review I found was again from tested.com with Norm interviewing Nate which seems to be tradition now. I would still really like to know what the screen configuration is. People are speculating on the actual resolution and many are concerned about clarity of text since there isn’t any in the demos. The diffusion going on is great to get rid of the SDE, but it does make everything slightly fuzzy compared to DK2. By far the biggest update to Crescent Bay since September is full integration of the positional audio. This wasn’t the case at Connect and it seems like it adds a great deal to the experience. It is clear Oculus is putting equal emphasis on audio which is great. I am still dismayed about the lack of anything on input. 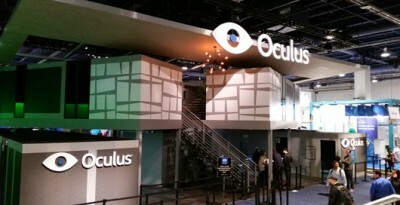 Oculus purchased Nimble VR, which is a competitor to Leap Motion. We were able to see just how cool hand input can be with the 3D Jam put on by Leap Motion and IndieCade this fall. I am still in favor of a hybrid Leap Motion and STEM System though – we must have sticks and buttons for things! Something has to happen and happen soon. Norm summed it up well in the CES interview above: “I don’t know of any gaming or entertainment platforms that have not shipped with input and have been successful”, and I feel exactly the same way. It is half the equation after all. I can also understand the importance of getting it correct. But, there needs to be an input system! Perhaps we will see some kind of input development kit around GDC. 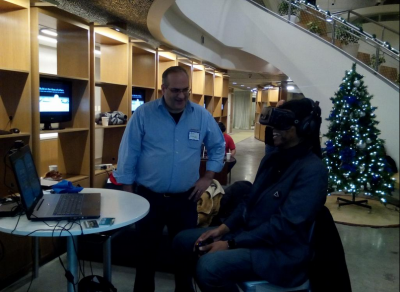 2015 = The year of VR and AR! Well the first month of 2015 isn’t even over and it is already shaping up to be an exciting year. I think it will out do last year and the wave of excitement and hysteria will peak again surrounding GDC. I bet we will see major announcements on all levels. What I am looking for is news on Unity 5 and the Oculus platform integration, DX12 and how it helps VR, NVidia/AMD driver level announcements related to VR, more on Windows 10 and HoloLens. From Oculus I am hoping to see asynchronous time warp for the pc, positional audio integration, and hopefully something on input. Well, that is all. Enjoy the ride! Check out the previous installment at Rift Ramblings (Part 6). Tagged ar, augmented reality, boston virtual reality, crescent bay prototype, hololens, indiecade, leap motion, lost loot, magic leap, miniature world, oculus rift, virtual reality, vr, world machine.